Obituary for David L. Tanner | Hunter Funeral Home, Inc.
David L. tanner, 80, of Ursa passed away on Thursday, June 14, 2018 in Blessing Hospital in Quincy. David was born on December 15, 1937 in Stillwell to the late Paul Harold “Jake” and Aileen (Crear) Tanner. He married Panchetta A. Grotz on April 12, 1958 in Hernando, MS.
David was a member of the Ursa Christian Church. 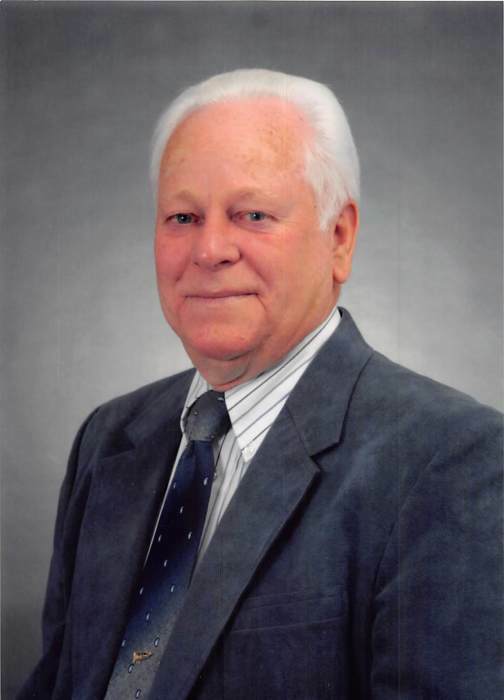 He owned and operated Tanner Construction for over 40 years. David was a volunteer firefighter with the Ursa Fire Department for over 30 years, on the Ursa village board for over 25 years and a longstanding member of the National and Illinois Land Improvement Contractors Association of America. He had a Private Pilot’s License and enjoyed traveling and going to casinos. David really enjoyed spending time with his children, grandchildren and his great granddaughter Brighton. Surviving are; his wife Panchetta of Ursa; four children, Cynthia (Kevin) Shriver of Glen Carbon, Tonia (Neal) Hemming of Quincy, Davette “Dede” (Stepen) Miller of Mesa, AZ., David G. (Patty) Tanner of Ursa; eight grandchildren, Nicolette “Nicki” Shriver, Kyle Shriver, Shane (Sadie) Asher, Candace (Greg) Huckstep, Andrew (Keri) Miller, Katherine “ Kayla” (Todd) Brown Brandon Hoebbing, Abigail “ Abbie” Tanner; one great grandchild, Brighton Brown and four siblings, Annie Carder, Joe Tanner, Larry Tanner and Judie Flesner. Services will be 11:00 a.m. Wednesday, June 20, 2018 in the Hunter Funeral Home in Mendon with John Simpson officiating. Interment will follow in the New Providence Cemetery near Ursa. Visitation will be from 4:00 P.M. until 7:00 P.M. on Tuesday, June 19, 2018 in the Hunter Funeral Home in Mendon. Memorial contributions have been suggested to the North Adams Home, Alzheimers Research or the Ursa Christian Church. You are invited to share memories of David and leave condolences at www.hunterfuneralhomes.com.